For some crazy reason, a lot of people will insist that "they don't like Westerns". 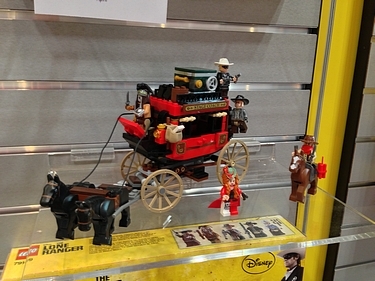 I have no idea what this is based upon, and I for one like Westerns quite well, so am delighted by the new Lego Lone Ranger sets. It's not the largest assortment they have in the books for 2013, but it's bigger than Spongebob was, at least! Check out the gallery of these rails and wagons, then come back tomorrow when I'll hopefully have finished up the Lego coverage, and moved on to the rest of the show!